As the new year looms, it seems an appropriate time to look at where, in upgrade terms, the Tube goes next. We will shortly look at the upgrading of the Sub-surface Railway and how the situation is developing there. The only major upgrade happening in parallel with this on the deep level tube lines was to have been the Northern Line Upgrade which is in progress and is due to be complete by the end of 2014. An obvious question to ask, therefore, is: what deep level underground line is next due to be upgraded and when? To discover this it would have made sense to consult the Tube Improvement Plan. The trouble is that nowadays that programme seems to be to be misaligned with reality. The Tube Improvement Plan – reality or myth? 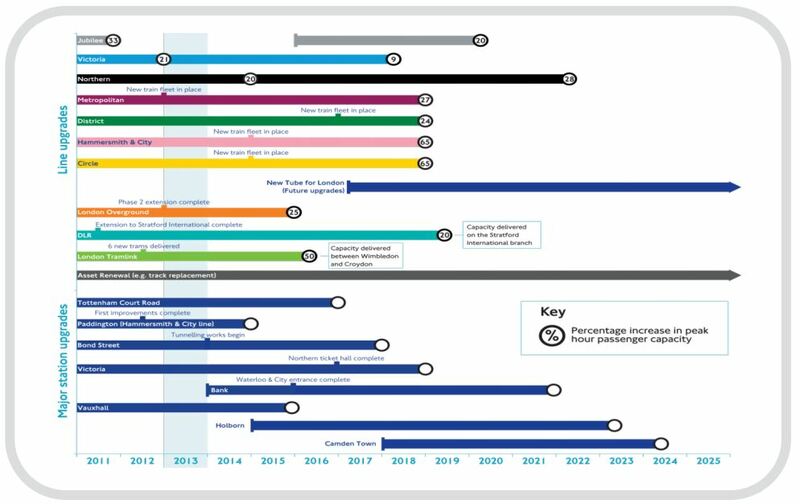 We last looked at the Tube Improvement Plan in detail just over a year ago. We then expressed our concern about what would happen if the money wasn’t forthcoming. What seems to have happened is that the plan has been substantially deferred and altered and a few much-publicised soundbites will need retracting. The defunct Tube Improvement Plan. Note that on this the Bakerloo Line is due to be upgraded. Also neither Holborn nor Camden Town feature as station upgrades. Although the fundamentals of the Tube Improvement Plan are still prominent on the TfL website it really must, in all reality, be considered dead. The February 2011 report with a possible timetable is no longer easy to find, and that is almost certainly deliberate. As we shall see, lines that are reported as having been upgraded with no future plans displayed are, under the latest plans, due further upgrading. Conversely, for some lines there are vague promises of upgrades but it is well-known that nothing much – at least from a passenger perspective – will seem to happen on these lines in the next decade or so. The medium term future (post 2018) now seems increasingly to be based around the “New Tube for London” or NTfL. We first noted the arrival of this particular soundbite as a potential “Deep Tube” replacement when looking at the plans for Crossrail 2 last June and we will report more on it soon. What is clear already though is that the NTfL programme as budgeted is much more restricted than the ambitions present in the Tube Improvement Plan. The Tube Improvement Plan was an incredibly expensive project. One figure mentioned was £13 billion – roughly equivalent to the cost of Crossrail, a major new railway with new tunnels under London. The heart of the problem, therefore, seems to have been money. That this should be the case is not really a surprise. We had already seen Mike Brown, head of London Underground, expressing great concern to the GLA transport committee that the money for the complete project was not yet assured. As political points were made and attempted on the subject of automation, he bluntly and correctly pointed out that talk of driverless trains was irrelevant if you hadn’t got the money for the both the trains and the necessary supporting line upgrades. At a subsequent GLA transport committee meeting Sir Peter Hendy, London’s Transport Commissioner, more or less repeated the same message about the need for the Tube Improvement Plan to be fully funded. He was clearly particularly concerned about the Piccadilly Line trains which, whilst performing well, were structurally getting towards the end of their designed life. With the subsequent greater squeeze on budgets, and other schemes that really could not be delayed such as both the Holborn and Bank Station Capacity Upgrades, it was looking inevitable that something had to give. To add to the financial pressure the Jubilee and Victoria Lines were both supposedly fully upgraded and no major new upgrade was budgeted for, yet it was rapidly becoming clear that further upgrades on these lines were, at the very least, highly desirable. It was also clear that a similar situation was going to arise on the Northern Line before too long. In one sense further upgrades on these lines would make more sense than spending money upgrading other lines. The basic infrastructure of the lines had been modernised. Assuming more trains could be run, a dramatic improvement could be made for little more than the cost of the extra trains and depot accommodation for those trains – assuming that extra trains were necessary. On the positive side, there were signs that the number of trains per hour that could be run on an automatic underground line in London were more than what was currently being achieved and more than previously thought possible. The Victoria Line today manages approximately 33 trains per hour (tph) for about an hour in each peak and very recently the central section of the Central Line has been timetabled for around 34tph for half an hour in one direction in the morning. In the case of the Central Line that is a train every 105 seconds which is the same as Ligne 1 in Paris – a line which is often held up as a mark of what can be achieved with full automation. This is an even more impressive achievement once the facts that Ligne 1 has much shorter trains and rubber-tyred wheels (better braking characteristics) are taken into account. This was more or less repeated by the mayor, and then further reiterated by Sir Peter Hendy in front of the GLA transport committee. In the light of subsequent events this has turned out to be a somewhat premature statement. The hope and belief clearly was that development and delivery of the new generation deep-level tube trains (now NTfL) would mean that trains would be specified without a driver’s cab. This would apply to all future train orders. The problem was that NTfL is a major technical advancement over what we currently have and the idea that the necessary development, placing of orders and delivery could be achieved in the timescales required ultimately turned out to be quite unrealistic, no matter how good the intention. In particular the emerging need for delivery of new trains on both the Northern Line by 2020 and the Jubilee Line by 2018 (to support extenstions and upgrades there) coupled with virtually no flexibility available to move stock around between different lines means that never ordering a train again without a driver’s cab simply wasn’t going to happen. In fact the wording of the famed quote is particularly unfortunate. As we shall see in a subsequent article, when we look at the Piccadilly and NTfL in more detail, it is highly likely that for the next 40 or so years tube trains will be delivered with a cab – even if it is one designed to be easily converted into passenger space. The only likely exception could be the Waterloo & City Line where it may well be possible to effect a changeover within a short period of closure, meaning one can go from old to new in one leap. Before we continue it should be emphasised that this is not, in itself, a bad thing. It is only in the black and white world of politics that cabs are either a good or bad thing. On the Underground all that matters is that the best-suited trains are purchased at the time when they are required. With all of the above context understood, it would seem that the easiest way to look what future plans currently are is to summarise the latest plans for each of the deep tube lines. Under the original Tube Improvement Plan the Bakerloo was next in line to be upgraded. The tube stock used is 1972 stock and is already over 40 years old. It is, in fact, currently the oldest passenger stock on the London Underground that is not already in the process of being replaced. It is also the oldest of the deep-tube stock. Even under the slipping timescales of the seemingly now defunct Tube Improvement Plan, some of the Bakerloo Line stock would be over 50 years old before withdrawal as the planned replacement wasn’t due to start appearing until 2021. The 1972 stock design was based on the even older 1967 stock used on the Victoria Line (and now replaced) so the the technology is really crude by modern standards. By most criteria, the Bakerloo Line stock would be the stock most urgently in need of replacement. This could either be by new stock or second hand stock off another line. The problem with second hand stock is that it only becomes second hand if some more new stock is bought, so accepting hand-me-down stock does not really solve anything in the bigger financial scheme of things. There is however a crucial difference between the Bakerloo and the other deep-level tube lines. This is that there is no desperate need on the Bakerloo Line to increase capacity. Passengers might want it and resent the crowded conditions, but objectively speaking compared to other lines it is not that bad. Indeed the reason proposals for extending the Bakerloo southward never go away is partly because it is the one deep-level tube where there is actually some spare capacity. The conclusion thus drawn was basically that, so long as the trains don’t actually fall apart, the Bakerloo Line could soldier on with a “make do and mend” policy. The risk of the service collapsing on the Bakerloo Line, despite its aged assets, is very small although probably higher than if the line had been upgraded. In fact it turns out that the Bakerloo line trains are falling apart – or at least eventually will do so if no action is taken – and for that reason replacement has become even less urgent. This may sound bizarre, so we will attempt to explain. It has always been a concern that the Bakerloo Line trains take quite a punishing on the tight bends that are present on the line. This is made worse because the trains were needed urgently and were hurriedly specified based on the 1967 stock – a design destined for the much gentler curves of the Victoria Line. These fears, it has emerged over recent years, were justified and it is clear that the trains won’t survive for many more years without some major rewelding taking place. This is sufficiently urgent to mean that there is absolutely no chance of any new stock under development being available in time to avoid the rewelding being necessary. Some refurbishment of the stock is thus already inevitable, and it’ll therefore be fit for quite a few more years afterwards. Whilst the service collapsing on any line is also highly undesirable, should that situation come about, Bakerloo Line passengers are better able to make their journeys by alternative routes than most passengers on most other lines. As if to confirm that, the recently publicised Night Tube map had the Bakerloo Line notable by its omission as the only major deep tube line with no proposed night service. 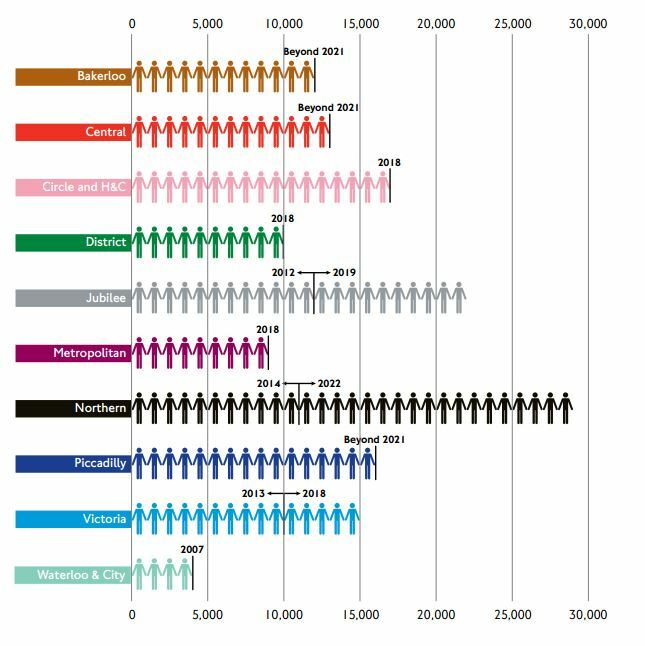 What is more, if the Bakerloo Line were to be disrupted for any reason, the number of people displaced would not be nearly as large as if it were on one of the busier deep level tubes. It is also the case on the Bakerloo Line that, unless passenger numbers increase dramatically and more trains are needed and can be sourced, there is really no good reason to have automatic train operation installed. The justification for doing so is almost always so one can run more trains. Without that need the incentive to automate the trains on the Bakerloo Line just isn’t there. The 1972 stock also lacks almost all the modern electronics now typically found in a tube train. Like the semaphore signal it might be obsolescent but it is still maintainable. This gives London Underground further reason to reconsider whether the right thing to do in the circumstances is to press ahead with new trains for the Bakerloo Line. The latest proposals for the future as featured in London Underground’s Fit for the Future online pack intended for staff. The small print states that “it does not represent LUL’s final position on the contents”. For our purposes what is significant is the total absence of any reference to the Bakerloo Line. Although “New Tube for London” does not explicitly state the line or lines affected significantly it is in the same colour as the Piccadilly Line. Not surprisingly, given the financial constraints present, the opportunity not to replace trains and signalling has been taken. This is not to say money will not be spent on the line. The control system desperately needs ripping out and replacing and, once one accepts that the signalling system is not going to be replaced any time soon, it makes sense to invest in making the existing signalling system as reliable as reasonably possible. At least with other lines being upgraded there shouldn’t be a shortage of refurbished spares. The Central Line stock is “relatively” new. The stock is 1992 stock so planned replacement would normally be for around 2032. Unfortunately the stock has not been a great success and the causes behind Chancery Lane derailment have never really been totally banished. In the way the world is, the stock may be newer than the Bakerloo stock but the electronics and signalling on the line is already dated. One only has to read Aslefshrugged commenting about the inability of the trains to stop unassisted at the correct stopping place in wet conditions to start to be aware of the problems. London Underground is still a long way off replacing the trains on the Central Line but acknowledges, incredibly, that it might have to make a considered judgement as to whether these get replaced before or after the Bakerloo Line trains. The Jubilee Line Upgrade was supposedly complete, but the increase in capacity was very quickly used up and the line is consistently severely overcrowded. When the line works well the trains are uniformly two minutes apart in peak hours (30tph). If the Victoria Line can already manage 33tph and the Central Line 34tph then the Jubilee Line should be able to handle 33tph easily and may even be able to run at 36tph – which is what was originally intended when the Jubilee Line Extension was being built. The design of trains one can add to the Jubilee Line to beef up the service is constrained by the platform edge doors. If trains on the Northern Line were being replaced (see below) there might have been more options involving using displaced trains from elsewhere, but realistically it now looks as if some “clones” will have to be built. Modern Railways (November 2013) reports that it is estimated that 16 new trains will be required. One surprising suggestion that seems to have some credence is that the Jubilee Line may just possibly go out to Harrow-on-the-Hill (on the Metropolitan Line) in order to avoid a ridiculous number of trains either ending up at Stanmore or terminating short and delaying following trains. Mike Horne, amongst others, discusses this. Presumably if London Underground were to do this then even more trains would be needed, as well as a fair amount of track alterations. It must be emphasised though that there is nothing in official documents to suggest that the Jubilee Line is going to have any route changes as part of the upgrade. 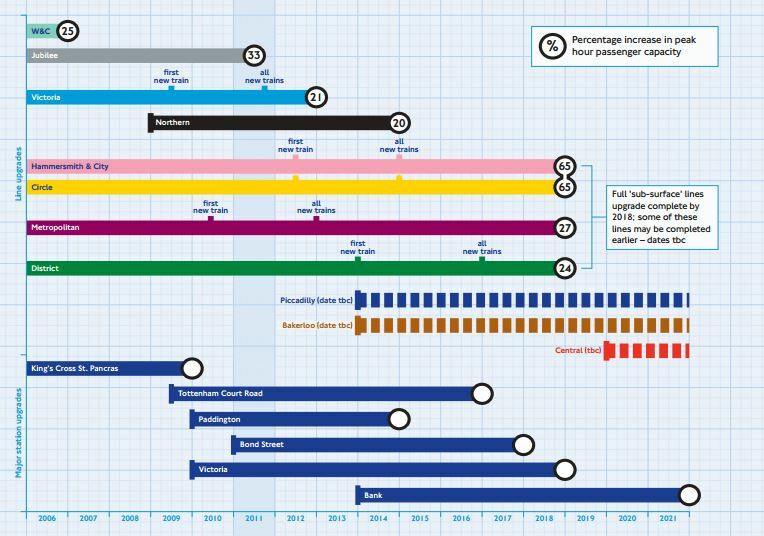 It is hoped that the further upgrade to the Jubilee Line can be complete by 2018 and this is a further reason why the solution cannot involve a new generation of trains – they simply won’t be ready in time. The first stage of the Northern Line Upgrade is now in progress. 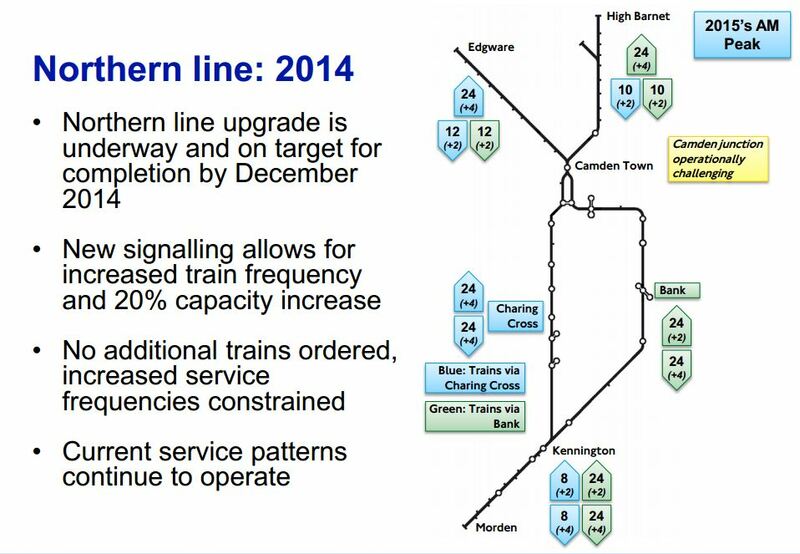 A presentation to Camden Council brought to our attention shows the planned service from 2015 onward. Contrary to earlier reports, it appears that the Morden branch will have 32tph in the peak – up from 27tph – and this appears to be backed up by documents presented to the Public Inquiry on the Battersea Extension. This will be welcome news especially in light of the difficulties boarding the crowded trains between Tooting Bec and Clapham North. What this does mean though is that talk of a “partial split” of the line with Charing Cross branch trains terminating at Kennington seems to be going in reverse, with more trains now planned to continue from that branch down to Morden than happens at present. Recent TfL slide illustrating latest proposal for train frequencies after Northern Line Upgrade 1. The above diagram illustrates the planned service in the morning peak. As now it is possible to operate a few extra trains in the northbound direction by arranging for all Charing Cross branch trains to go to Edgware, and for all Bank branch trains to go to High Barnet. This maximises northbound capacity at Camden Town by totally segregating the flows. In the southbound direction this is not possible and there is a disparity between the number of trains going north and the number of trains returning south. It is also not practical to employ the same method in either direction in the evening peak. Modern Railways (November 2013) suggests that a further five trains will be needed for the opening of the Battersea Extension which is currently planned for 2020 but it implies that not all Charing Cross branch trains will initially serve Battersea. This fits in with written evidence given by TfL as part of their proofs of evidence at the Public Inquiry. Previously the figure of ten extra trains for implementation of a full service to Battersea was the generally quoted figure. 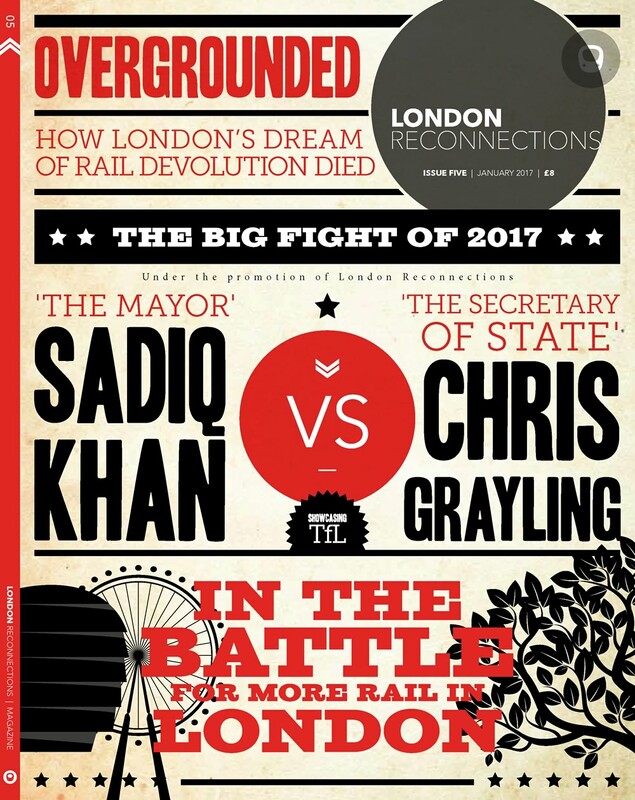 Modern Railways also talks about Northern Line Upgrade 2 which is, or was, the full separation of the Northern Line. Not surprisingly it is rather vague as to the total needed if this were to go ahead. The presentation to Camden Council (mentioned above) shows plans for an upgrade to Camden Town station but it is not clear if this is enough to allow complete separation of the two central sections of the Northern Line. It is difficult to see how an order for the five trains required for the opening of the Battersea extension can possibly be economic for a train manufacturer and Modern Railways suggests a combined order with the new Jubilee Line trains. This creates the minor problem that Northern Line trains are six cars long as opposed to the Jubilee Line’s seven. Fortunately one of the seven cars is a pure trailer with no vital equipment within it that is relied upon by any other part of the train. Of more significance is that the 1996 (Jubilee Line) stock actually has an older type of traction motor than the technically more advanced one in 1995 (Northern Line) stock. So a combined order may provide lookalikes for the Northern Line but they would need to be treated differently for maintenance purposes and there may be electrical issues elsewhere. Like the Jubilee Line, the Northern Line needs its initial trains by a date which is prior to the earliest possible date of any new generation of tube trains appearing. A study looking at the feasibility of running 36tph on the Victoria Line has been ongoing for some time. From reports made it seems that issues such as the need to remove the additional heat are of more concern than the need to find extra trains. It also appears that the option of running the entire service, at least in the peaks, from Walthamstow Central to Brixton is being investigated. Given the incredible amount of time currently taken to terminate a train a Seven Sisters one suspects that, provided Walthamstow Central can handle the extra terminating trains, this may be do-able without requiring additional stock. At the other end of the line, however, it seems likely that there may be an issue as to whether one can terminate 36tph at Brixton. This is obviously dependent on how long it takes between arrival of one train and the arrival of the subsequent train in each of the two platforms. The surprisingly specific figure of 203 seconds has been given in one article as the minimum platform reoccupation time at Brixton. Given there are two platforms and 36tph is the equivalent of a train every 100 seconds this means that the figure, if correct, needs to be brought down to an absolute maximum of 200 seconds. It is not known if the 203 seconds is calculated on the assumption that the “ready to depart” light only lights up once the route is clear for the train to proceed. Assuming that this assumption is true, there is an obvious opportunity for a few more seconds to be saved with a more advanced signalling setup that anticipates when the route will be set and available for the next departing train. The Victoria Line currently runs 33tph with 39 trains. As it only runs 33tph for about an hour at a time it might just not quite be sustainable to do so over a longer period with with the same number of trains. The end-to-end run time is around 34 minutes which, when combined with a 3 minute turnaround time, gives a round trip time of around 74 minutes. So it would initially appear that an extra train may be require to sustain 33tph, although there is probably still some slack in the timetable that can be exploited to counteract that. Modern Railways (December 2013) reports that the Victoria Line will go to 34tph from April 2014 and it will run that frequency for longer than the current “high peak”. This seems a logical progression. In fact it will almost certainly run trains consistently timetabled to be 105 seconds apart, which is slightly over 34tph. The 105 seconds interval is known to be achievable because that is what happens now. The only difference is that currently there is the odd two minute gap instead of 105 seconds inserted after every fifth train just to allow a little bit of recovery time. So currently in the high peak 5 trains run every 9 minutes – which is actually slightly more than 33.3tph. There are 47 trains in total and it was always intended that 43 trains should be available for service if needed. If 36tph was considered to be feasible then there should be just enough trains to achieve this. It probably always was the aspiration, but never the commitment, to run 36tph. There has been no suggestion of buying new trains but there may well be a need to spend money in other areas to achieve the desired frequency. Rather intriguingly a thread on District Dave’s website suggests that the Victoria Line will go to a full 36tph from next April. If true, it would be a bold step by London Underground to do this in one leap rather than initially go for 34tph. One possible reason may be the desire to know for certain they can run at 36tph before committing to order more trains for the Jubilee Line with the intention of achieving the same frequency there. This jump straight to 36tph does seem to be unlikely though as it is not mentioned in the latest business plan. A chart showing capacity increase by passenger numbers since 2006 that appears in the TfL December 2013 business plan. There is nothing here to suggest that the Victoria Line will be fully upgraded before 2018 let alone next year. Also there appears to be no plans whatsoever to further upgrade the Waterloo & City Line. For a long time it was thought that the Waterloo & City would be the testbed for the new generation of tube trains. This did appear to make a lot of sense but that plan has been abandoned. The main reason would appear to be that it was not thought that the Waterloo & City would really test the whole system of next generation of trains, signalling and railway operation in any meaningful system-wide way. The argument was that there was no point in testing the components as these were already in use in various places in the world. What needed testing is the interfaces needed on a typical tube line and the Waterloo & City Line wasn’t typical of anything. To some extent the argument over system testing has a lot of merit. Even looking back to the 1960s, when things were a lot cruder than today, the weaknesses of testing in a less challenging environment than the one ultimately intended could, in retrospect, have been seen. Much was made about testing Victoria Line trains using the line between Hainault and Woodford. It is easy to look back and wonder how the implementers of the day imagined that running trains at infrequent intervals over a short on-the-surface line on one of the quietest sections of London’s Underground system with few passengers could possibly have tested whether the system was suitable for the Victoria Line. With the benefit of hindsight it is easy to argue that the use of the Woodford – Hainault tests lulled the designers into a false sense of security and Victoria Line users suffered for the next forty years as a result. With the argument of being a suitable testbed abandoned, the Waterloo & City does not seem to be in a good position to be upgraded. It cannot present a good business case as although it does get very crowded this is for a very short period in peak hours and only in one direction. Unless any upgrade could actually deliver extra capacity it is difficult to see any point in it unless the trains or other equipment gets to the point of being life-expired. Even then there may be second hand stock stock around by that point which could be used. If you are arriving in London at St. Pancras or Kings Cross, its convenient, but probably not otherwise. I find this particularly true since Tuesday 24 November 2015, when I joined the in-crowd who know that you can catch a lift up to the footbridge and exit Kings Cross to the west. According to Modern Rail, the deep tube plans have changed again. Piccadilly is still first, but the Central will get a interior upgrade to make it RVA compliant (to go with all the other motor and rust work) and will be expected to last a bit longer. Bakerloo gets bumped to second place and maybe extension to Lewisham might happen. TFL are looking at three tenders, announcement of the winner delayed to next year as it now wants to look at quote for the whole programme not just the Piccadilly first phase. Currently looking at 100 trains for the Piccadily, then 40 for Bakerloo, and then 100 for Central and 10 for Waterloo and City. Rational Plan. “Piccadilly first” has been the deep tube plan for at least the last three years. The corrosion repairs and all the other modifications to the central line have been in TfL’s plan for just as long, and have been subject of a number of publically available papers to the TfL Board and various committees. For deep tube they do indeed have three rolling stock tenders but two of their tenderers have indicated their intention to merge! Waiting for signalling to catch up is also an excellent delaying tactic when money is tight. The article seemed to imply more work was to done on the Central line trains than planned. The main thrust of which it would delay the replacement of the central line trains and that Bakerloo would now follow the Piccadilly. Where will they fit ten (presumably 4/5car) trains on the W&C? Presumably depot reconfiguration and Bank stablers? 10 WC units suggests a 90 second frequency with a 4 minute journey, 2 minutes turnaround at Bank and 3.5 minute turn round at Waterloo. For 30 seconds each cycle there would be 3 trains at Waterloo 2 at Bank and 4 in transit . The rest of the cycle would have 6 on the line and 3 at termini.. One spare on depot. This is the scope. The only items that have crept in more recently are in the third list. – LED lighting – reduced energy consumption and to improve lighting levels. Order size is rounded estimate. Current Underground News summarises a report with W&C at 5-7 trains, compared to 5 now with no spare train. Armstrong lift road could be relaid? W&C is 10 years off anyway!